Celebrity Gossip and Entertainment News: Adele Working on a New Album? Adele Working on a New Album? Adele hints that new music may be out later this year. If might feel like it’s been forever since Adele released her world-crushing, Grammy-winning 21album. But, actually, she’s right on schedule. And although we’ve heard next to nothing about her third full-length release, it sounds like the drought is almost over. As it turns out, today is the 26-year-old singer’s birthday, which makes us think that the sequel to 21 might just be called 25? 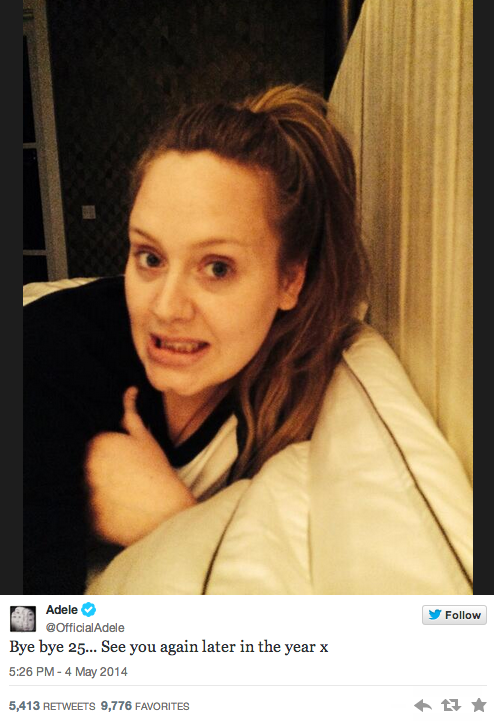 And if that’s the case, well, Adele is perfectly on schedule. Her debut, 19, came out in 2008 and 21 followed in 2011. The “Rolling in the Deep” star has reportedly been writing with former Genesis singer/drummer Phil Collins, OneRepublic’s Ryan Tedder and Grammy-winning songwriter Diane Warren on the new disc.